Marci has a Simple Planning Guide for a Stress-Free and Christ-Focused Thanksgiving Dinner. Andy shares 5 Things to Do If Celebrating Thanksgiving Is Hard This Year. If you’re planning ahead, Robyn has Children’s Christmas Advent Calendar Ideas with a free printable. I found pretty decorating inspiration at 75 Farmhouse Christmas Living Room Decoration Ideas. Thinking maybe I need these in my life – Reese’s Peanut Butter Pudding Cookies. I’ll have to come up with an occasion to bake them for! 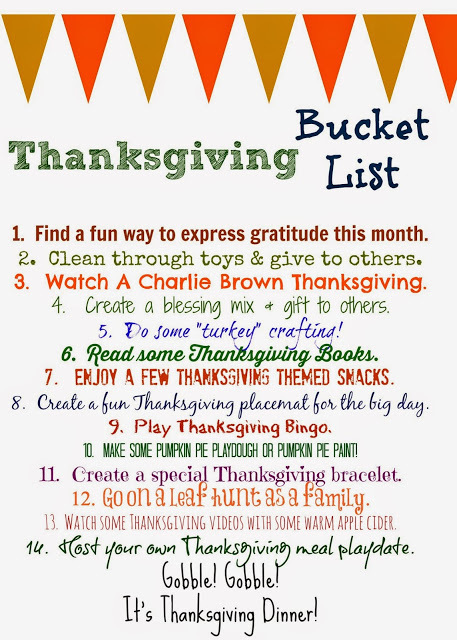 I like this Thanksgiving Bucket List from The Chirping Moms. What a great site and article! Thanks for sharing my post. Blessings! Mmmmm, chewy cookies are my FAVE!!! Happiest Thanksgiving! Ours is quiet: just the 4 of us, and half are sick. Still praising God: at least it’s THIS week over a holiday, instead of during intense pre-exam time next week at school & intense cheer practice before our 2-day comp Dec 2-3! Hope everyone is feeling better by now!! Yes, sometimes even the timing of sickness can be something to be thankful for 😉 Been there! !